Please note that all the advice given is intended only as a guide and that no responsibility for loss or damage will be accepted as a result of implementation of such advice. If you are a man, ask a female if she thinks you're as able as you obviously think you are, if the answer is unhappily no, then take her advice and leave it to a repairman. Under no circumstances remove the top cover, the back cover, or attempt to gain access to the underside of the washing machine when the electricity supply is still connected. 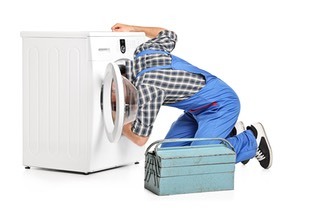 If you do look inside the washing machine, always disconnect the power completely rather than just switching it off at the switch as there may be an error in the house wiring that means that the live side of the supply is still running through the washing machine! If you are divorcing and your wife states that you are competent enough to repair the washing machine, when previously, she hadn't trusted you to boil an egg, beware, she may be attempting to save on lawyer and burial fees by hoping you will touch a live connection, thereby granting her a 'quickie' divorce and cremating yourself prematurely into the bargain!